Serving an international community, Scandinavian artist Yenny Cocq was selling her “little people”sculptures through retailers. She approached me help brand and define a product line and create a Yenny Cocq Sculpture online store. Since launching the Yenny Cocq Sculpture online store, Yenny’s sculptures have appeared on the December 2016 cover of Handmade Business Magazine and are featured in Artfinder’s Best of 2016 list. Create an international branding platform that both represents Yenny’s art and her Scandinavian roots. We needed to organize the Yenny Cocq Sculpture inventory into collections for retail and whole sale clients. Given the fact that families also came in so many shapes and sizes I proposed a “Build Your Own Family” page in the online store. Industry recognition: Yenny Cocq Sculpture appeared on the December 2016 cover of Handmade Business Magazine and is featured in Artfinder’s Best of 2016 list. WestEdge Design Fair,the premier contemporary furniture fair on the West coast, contacted Launch Creative Lab four years ago to work on their image and marketing for the show. I have managed their account and worked as their Art Director for the last four years. Today we continue to grow their brand and national presence. Each year we update the branding, increase their social media presence and continue a tradition of using an industry relevant color scheme. This catalog was designed for Christie’s International Real Estate to educate real estate partners to demonstrate how to market their properties. The design of the catalog is inspired by the Design Within Reach catalog created by Pentragram. Voasis: The Santa Fe Desert Chorale’s First A Capella Group lead by Deke Sharon, music director for The Sing-Off and Pitch Perfect. Results: Sold out shows, brand new audience members, 47% revenue increase As part of the overhaul for the Santa Fe Desert Chorale program we created Voasis, an cappella group. All of the singers were based in Los Angeles. We hired a photographer, Jennifer Esperanza, to photograph the group for advertising. Launch was hired as a Marketing Consultancy to move their antiquated image into a modern and sophisticated one that would reflect the high caliber of their talent as a respected professional choral group. Advertising and a grass roots marketing program lead to record ticket sales and a 47% revenue increase. To establish solid branding with a new website, national print and digital campaign. We needed to speak to the high-caliber brands WestEdge engages and create a fresh and modern look. A comprehensive campaign through national and regional print and digital advertising outlets, plus exposure through the websites and newsletters of 65+ media, industry and cultural partners, and sponsors. The 2015 campaign garnered over 300 million media impressions with partners’ branding featured throughout. A national advertising campaign that targeted both the design trade and affluent consumers, and generated nearly 90 million advertising impressions. This national ad campaign consisted of print ads in major publications, email blasts, a social media campaign, outdoor advertising and digital marketing through media partners across the country. Media included ads in The New Yorker, The Wall Street Journal, Architectural Digest, The Los Angeles Times, Los Angeles Magazine, California Homes, GRAY, and Modern Luxury. The show has grown to 150+ exhibiting brands and 10,000 attendees, with 60+ presenting speakers, 35+ industry associations and 26+ media partners. Media Preview for the Opening Night Party at the WestEdge Design Fair. Digital assets include Instagram ad, banner ads, and ticketing banner. Schwinn sponsored the opening night party for the WestEdge Design Fair. Designers were each given a Schwinn bicycle to design and reinvent in an inspiring fashion. The event benefited the Los Angeles Ronald McDonald House. Origami: When I discovered Origami a whole knew world unfolded. Using an origamic technique I created this piece to sell advertising for Architectural Digest‘s Great Design Around the World issue. To celebrate the opening of the residences at One Central Park at the Time Warner Center, Architectural Digest invited 23 highly acclaimed interior designers to imagine room settings for New York City’s most glamorous property. I was hired by the Santa Fe Desert Chorale as a Consulting Marketing Director/Art Director to move their antiquated image into a modern and sophisticated one that would reflect the high caliber of their talent as a respected professional choral group. Record ticket sales and a 47% revenue increase where attributed to an advertising and a grass roots marketing program. I was hired by the Santa Fe Desert Chorale as a Consulting Marketing Director/Art Director to move their antiquated image into a modern and sophisticated one that would reflect the high caliber of their talent as a respected professional choral group. Advertising and a grass roots marketing program lead to record ticket sales and a 47% revenue increase. Voasis: The Santa Fe Desert Chorale’s First A Capella Group lead by Deke Sharon, music director for The Sing-Off and Pitch Perfect. As part of the overhaul for the Santa Fe Desert Chorale program we created Voasis, an a cappella group. All of the singers were based in Los Angeles. I hired a photographer, Jennifer Davis, to photograph the group for advertising. I was hired by the Santa Fe Desert Chorale as a Consulting Marketing Director/Art Director to move their antiquated image into a modern and sophisticated one that would reflect the high caliber of their talent as a respected professional choral group. Record ticket sales and a 47% revenue increase was attribute to advertising and a grass roots marketing program. The Santa Fe Desert Chorale hired me as a Marketing Consultant/Art Director to move their antiquated image into a modern and sophisticated one that would reflect the high caliber of their talent as a respected professional choral group. This was a big leap forward for the Chorale’s image which began a marketing plan to evolve their image over the next 5 years. Ccollateral materials for Christie’s International Real Estate branding. The design of the catalog is inspired by the Design Within Reach catalog created by Pentragram. Schwinn sponsored the opening night party for the WestEdge Design Fair. Designers were each given a Schwinn bicycle to design and reinvent in an inspiring fashion. The event benefited the Los Angeles Ronald McDonald House. 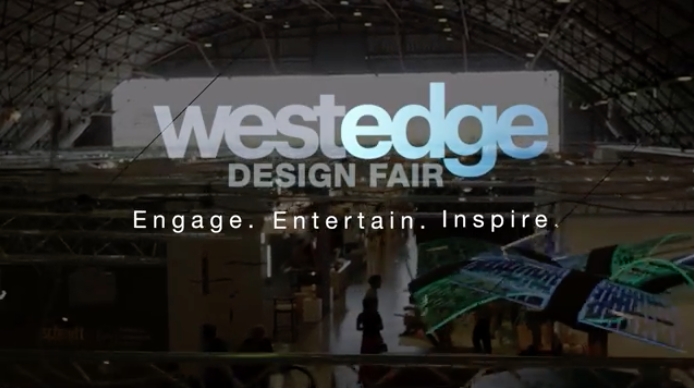 WestEdge Design Fair, the premier contemporary furniture fair on the West coast, contacted Launch Creative Lab four years ago to work on their image and marketing for the show. I have managed their account and worked as their Art Director for the last four years. Today we continue to grow their brand and national presence. Each year we update the branding, increase their social media presence and continue a tradition of using an industry relevant color scheme. I was hired by the Santa Fe Desert Chorale as a Consulting Marketing Director/Art Director to move their antiquated image into a modern and sophisticated one that would reflect the high caliber of their talent as a respected professional choral group. Advertising and a grass roots marketing program lead to record ticket sales and a 47% revenue increase. This was a big leap forward for the Chorale’s image which began a marketing plan to evolve their image over the next 5 years. To move the Santa Fe Desert Chorale’s marketing materials and website into a modern and sophisticated image while respecting its traditions. Juan Lopez, the Oakland based mosaic tile designer approached me needing a website after several articles where written about his public art projects. I created a simple website that mimics tiling. This website highlights Juan’s mosaic work and the recognition it receives. I have managed the WestEdge Design Fair account and worked as their Art Director for the last four years. Here you will see some of the 2016 print advertising. This national advertising campaign targeted both the design trade and affluent consumers, and generated nearly 90 million advertising impressions. This national ad campaign consisted of print ads in major publications, email blasts, a social media campaign, outdoor advertising and digital marketing through media partners across the country. Media included ads in The New Yorker, The Wall Street Journal, Architectural Digest, The Los Angeles Times, Los Angeles Magazine, California Homes, GRAY, and Modern Luxury. The Producers of the now award winning PBS documentary Awakening in Taos hired me before it was released to give the movie a public image that would promote the film and attract donors. This film celebrates the extraordinary life of Mabel Dodge Luhan, patron of the arts and a major figure in the Modernist Movement. Create a public persona that would garner attention worthy of a PBS film. The film’s DC Premiere was at the Smithsonian American Art Museum in Washington, D.C.
After we branded the film, Awakening in Taos premiered in Santa Fe to a full house. This is a special advertisement for Porsche presenting Porsche designers as part of a community of tastemakers. I was hired by the Santa Fe Desert Chorale as a Consulting Marketing Director/Art Director to move their antiquated image into a modern and sophisticated one that would reflect the high caliber of their talent as a respected professional choral group. A modern responsive website was an essential part of this campaign. I transformed their web presence which began a marketing plan to evolve their image over the next 5 years. I design books for Benchmark Education which is recognized for its award-winning print and digital solutions. They feature content-rich leveled texts in English and Spanish; explicit instruction in close reading and analysis, genre, and cross-text study; and a wide array of differentiated resources that enable educators to target literacy intervention. I gave art direction for this video to maintain consistency with our branding platform. Image People in Los Angeles produced this video for the WestEdge Design Fair. Architectural Digest initiated working with both The Emmys® and The Oscars® awards to design their greenrooms. This was a great opportunity to have advertiser’s products featured in the greenrooms and to work with interior designers. 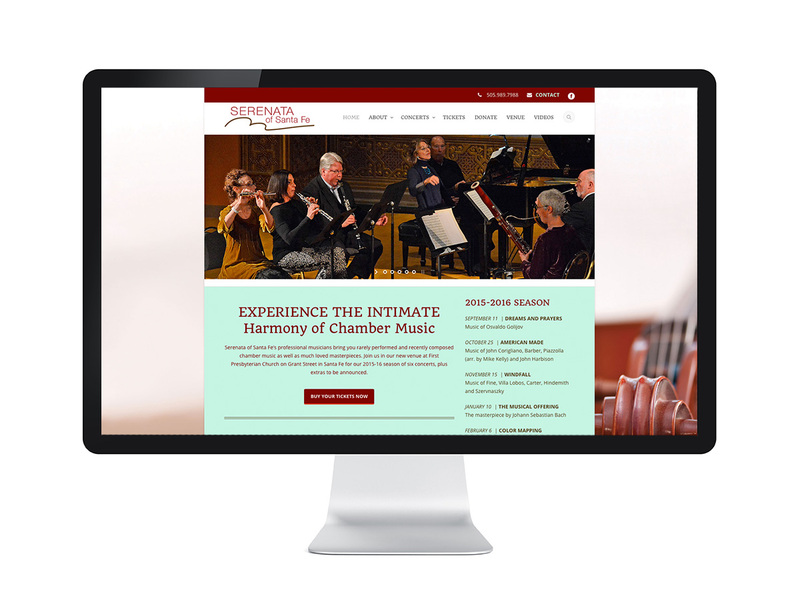 Serenata of Santa Fe was referred to me at Launch Creative Lab when they wanted to change their image to match the professionalism of this Chamber Music group. We have worked together for the last four years. Each year we create collateral materials, increase their social media presence and expand the website to grow their brand. To establish solid branding with a new website design and a local print campaign. We needed to speak to the high-caliber music and audience Serenata of Santa Fe attracts. Jamie Figueroa approached me looking for a contemporary and simple website design to market her business as a writing consultant. We used a Parallax design with two simple colors, grey and mint green. Jamie has been invited into a doctoral program so the full website is currently viewable on the backend of Launch’s site. This booklet was designed for Baker Furniture as a magazine insert that accompanied a full page national ad to promote their lighting and accessories. Advertorial spread to advertise 165 Charles Street in New York City designed by Richard Meier. Special advertising section designed for the luxury furniture brand Roche Bobois. Special advertising section created to showcase high-end home décor. Cayuga ENT, a Ear, Nose and Throat, Head and Neck Surgery Office needed to update the outdated design of their website and make it mobile responsive. I created a simple, clean and accessible site for Cayuga ENT. Serenata of Santa Fe was referred to me at Launch Creative Lab when they wanted to change their image to match the professionalism of this Chamber Music group. We have worked together for the last four years. Each year we create collateral materials, increase their social media presence and expand their website to match the growth of their brand recognition. To establish solid branding with a new website design coupled with a local print campaign. We needed to speak to the high-caliber music and audience Serenata of Santa Fe attracts.